Heidi Klum stepped out this evening(January 7th) for the 75th Golden Globe Awards at The Beverly Hilton in Beverly Hills, CA. 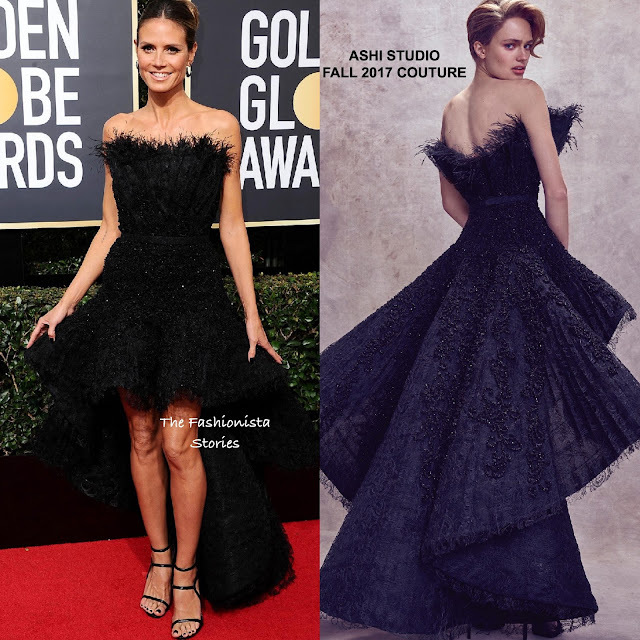 Showing some leg, she wore a ASHI STUDIO FALL 2017 COUTURE black strapless feather beaded hi-lo hem, ruffle dress which she accessorized with LORRAINE SCHWARTZ jewelry and LE SILLA sandals. Minimal make-up was also trending on the red carpet so it is no surprise that Heidi opted for the same look as well. A pinned up-do finished up her look.